This description of the Book of Hosea is from Easton's Bible Dictionary. "Hosea, Prophecies of: This book stands first in order among the "Minor Prophets." "The probable cause of the location of Hosea may be the thoroughly national character of his oracles, their length, their earnest tone, and vivid representations." This was the longest of the prophetic books written before the Captivity. Hosea prophesied in a dark and melancholy period of Israel's history, the period of Israel's decline and fall. Their sins had brought upon them great national disasters. "Their homicides and fornication, their perjury and theft, their idolatry and impiety, are censured and satirized with a faithful severity." He was a contemporary of Isaiah. 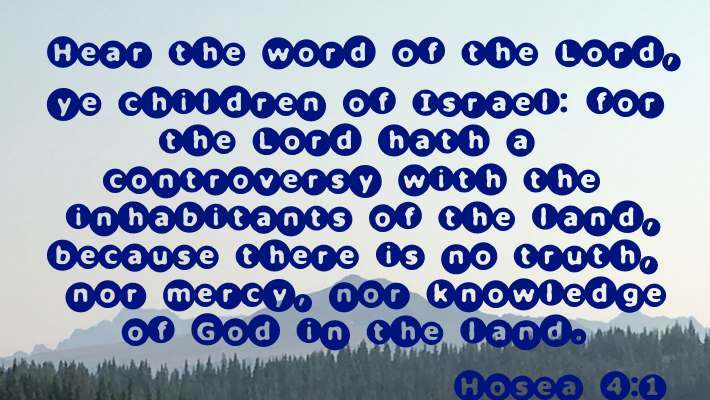 Quotations from Hosea are found in Matthew 2:15; 9:15; 12:7; Romans 9:25,26. There are, in addition, various allusions to it in other places (Luke 23:30; Revelation 6:16, comp. Hosea 10:8; Romans 9:25,26; 1 Peter 2:10, comp Hosea 1:10, etc.). As regards the style of this writer, it has been said that "each verse forms a whole for itself, like one heavy toll in a funeral knell." "Inversions (Hosea 7:8; 9:11,13; 12:8), anacolutha (Hosea 9:6; 12:8, etc), ellipses (Hosea 9:4; 13:9, etc. ), paranomasias, and plays upon words, are very characteristic of Hosea (Hosea 8:7; 9:15; 10:5; 11:5; 12:11)".